Emergency landing of military aircraft on a freeway will be part of the second stage of the annual Han Kuang military drills, to be held toward the middle of the month. The Ministry of National Defense also plans to transport troops using civilian aircraft for the first time. 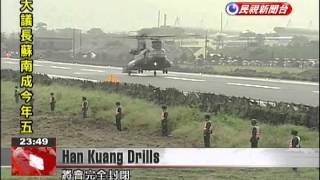 For this year’s Han Kuang military drills, the air force will practice using the Minsyung alternate runway in Chiayi. E-2K early warning aircraft have an extremely large wingspan which spans nearly the entire width of the freeway. An extremely precise landing is necessary. From midnight Sept. 16 until 11 am, a road closure will be in effect between Minsyung and Chiayi interchanges on National Freeway 1. We hope that our personnel can optimize efficiency, so we will minimize the amount of time that the runway is open. In the past, the armed forces rented private boats and carriages on the high-speed rail to transport troops. Another transportation mode will be employed this year. For the first time, we leased civilian aircraft to transport our troops for the drills. On Sept. 17, a fleet of six battleships will carry out a joint intercept drill off the coast of Suao. Live ammunition drills will also take place near Penghu, Pingtung and the East China Sea.